I was trying to decide on my resolutions as 2016 drew to a close. Hubby and I talk a lot about what is important to us and what our goals are. A recurring theme is a move towards more minimalism in our lives. I was perusing blogs about minimalism in December and I came across Cait Flanders' blog and read about her no-spend year(s). 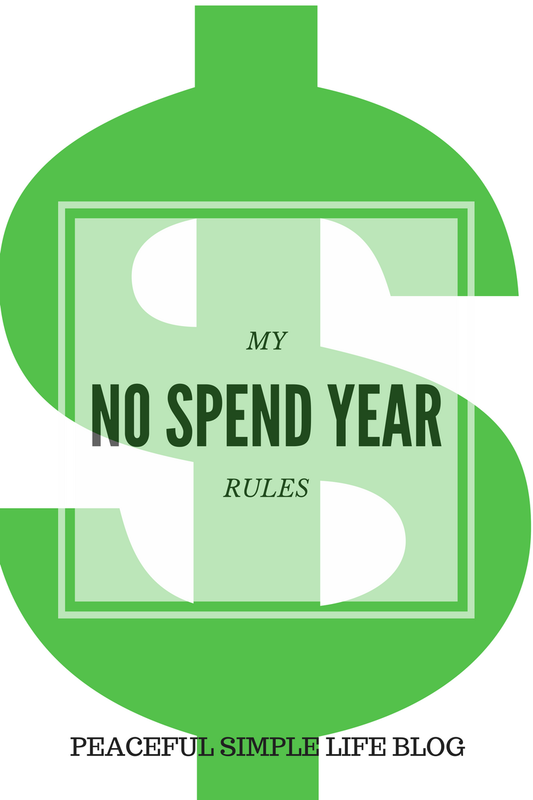 I was super intrigued and after some consideration, I decided to pursue a no-spend year. I had a miscarriage last year and we had some big changes. My husband found a new job and the plan was to move to a new city. We bounced between 2 towns for months and our family lived apart for some of that time. We sold our house and soon after found out that my Husband had been laid off from his job. Hubby and I ended up taking our old jobs back and renting a home in the same town that we had been trying to leave. Last year felt super chaotic and during that chaos I shopped. I wouldn't say that I was crazy or a shopaholic, but I was definitely using more than my fair share of the budget on items that we didn't need. I bought a ton of clothes and home decor items with little regard for our household budget. It was a poor reaction to my stress. I have decided that I need to learn better coping skills for overwhelming times. The no-spend year will force me to do that, as my fallback coping method (shopping) will no longer be available to me. To be clear, this no-spend year is for myself only. I am not requiring my Hubby to stop shopping nor am I going to stop purchasing items for my daughter. I will, however, focus on only purchasing needs for my daughter and not allowing myself to go crazy spending on her. I am going to break down my rules, approved shopping list and banned shopping list for you below. I am truly looking forward to the year and I hope that I learn a great deal throughout it. I also hope that I am able to save money, as well! 1.) I can purchase need items. I am not restricting the purchase of medications, groceries, feminine products or anything else that I may need. I will be mindful of my purchases and I will make sure that I don't already own the item before I purchase it. 2.) I can replace toiletry items as they run out. If I need more shampoo, foundation or toothpaste, I will buy those items. The previous item has to have run out or be spoiled. I can not purchase any new makeup/toiletry items. 3.) I can purchase items with my Christmas money. I received $140 for Christmas and I am allowing myself to spend that money however I want. I am only allowing that money, however, so once it is gone I don't get anymore spending money for the year. My goal is to still have that money at the end of 2017. 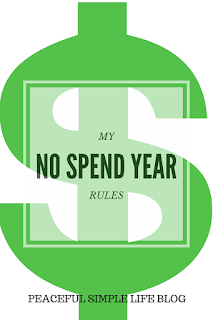 Have you ever completed a no-spend month or year? How was it? Any tips for me? I would love to hear from you! This is so interesting! I feel like I break restrictions on myself almost as soon as I set them (I really do need to trick myself in order to be successful I guess, ha! ), so I'm really curious to see how this goes for you and what you learn from the whole experience! Thanks, Jess! It should be a journey... I read Gretchen Rubin's book on habits and I am total rule follower! I do hope this goes well! Way to go. I don't know if I could do it. Well maybe I could, but not sure I want to. I am excited to see how this goes over the year!!! Ha ha! Thanks! I hope it all goes well!